It's not hard to understand why famed German writer/director Werner Herzog would have been drawn to the true life story of Gertrude Bell, the subject of his latest film QUEEN OF THE DESERT. Bell was, like many of Herzog's protagonists, a person driven to do things that everyone else said were impossible, or in her case, at least not the sort of things that a woman should do. And her adventures in the same desert locales as T. E. Lawrence gives Herzog, who relishes the challenge of filming on real, often difficult locations, yet another chance to do battle with nature in the course of making his film. One can also easily grasp why Nicole Kidman would have jumped at the chance to tackle the lead role. In Bell, she gets to play a woman who was a real-life adventurer, not some cartoonish female action hero (which seems to be the only lead role available to women these days outside of Oscar season). It's a shame that what's on screen is so lifeless and inert. There are no technical flaws to be found. The cast is fine, which in addition to Kidman includes James Franco and Robert Pattison (as the aforementioned T. E. Lawrence). Cinematorgrapher Peter Zeitlinger captures some beautifully desolate desert imagery. And as mentioned, Bell's story has all the elements that should make for a rousing good time. 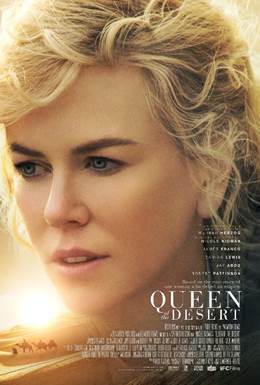 But QUEEN OF THE DESERT is the opposite of the old saying, "the whole is greater than the sum of its parts." All the ingredients for a good movie are here, but they just don't gel. And in the end, I find myself saying something I've never said about a Herzog film: it's boring. 2 out of 4 stars.